Welcome back for another season of Hockey Hugs, Puck Daddy's celebration of the huggingest league in professional sports, the NHL. National Hug League, they should call it. These dudes know how to snuggle. It's not surprising. Hockey's a physical game. Elite hugs just make sense. I mean, look at the way Damien Brunner is nuzzling on Adam Henrique here. Appreciate that form. Cheek to cheek. Arms wrapped all the way around, with Henrique's neck resting in the pit of Brunner's right arm, and his shoulder drawn in with Brunner's left. That's a first-line hug right there. There may be a little more emotion in this one than usual. Brunner, after all, very nearly missed joining an NHL team this summer. His contract with the New Jersey Devils spared him from spending the season exiled in Europe. This is the hug of an appreciative man. And as for Henrique, well, one of his teammates just abandoned him to go to Russia. He has to be feeling especially fragile. This hug could very well be the result of a perfect storm of emotions. It sure looks like it. Six more hugs coming right up. Michael Frolik goes for the leaping superhug on Eric Tangradi, but after a long offseason, he's a little out of practice. "Unhf! My groin and face!" Francois Beauchemin gets in a little close. "I hear through my ear, Francois. Not my mouth." 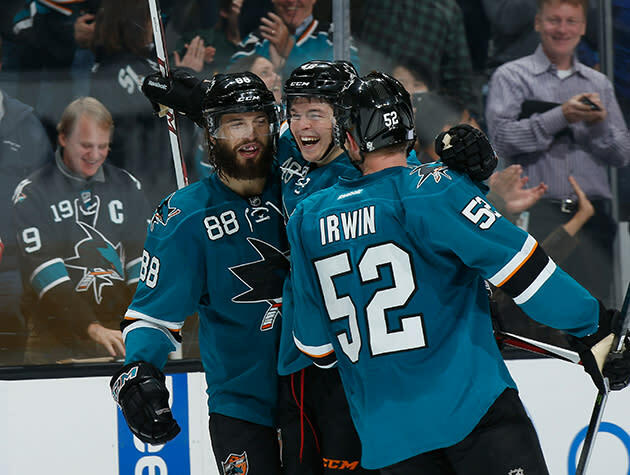 Tomas Hertl and Brent Burns star in "A Kid and His Monster". "Hey Burnsie, have you seen my cat?" "Ha ha ha oh Burnsie!" "Seriously, I ate your cat." Cam Atkinson and Sergei Bobrovsky share a tender moment. "I made you a friendship necklace, Cam. It's in my locker." "Bob! I made YOU a friendship necklace!" "Let's be best friends forever. "Yes. You can't spell Columbus without 'us'." 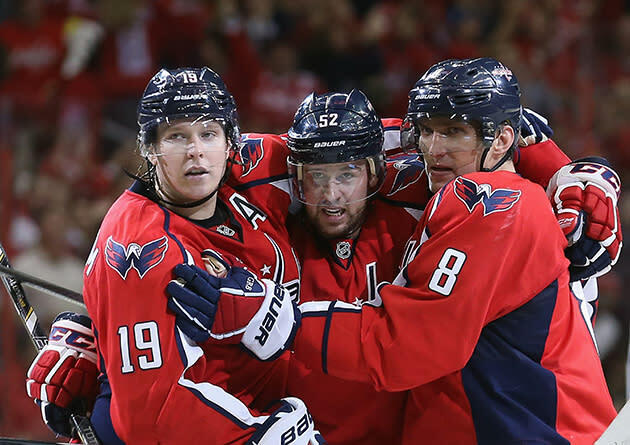 Nicklas Backstrom, Alex Ovechkin, and Mike Green celebrate a goal, and then suddenly remember Adam Oates hates joy. "He's definitely gonna beat us." 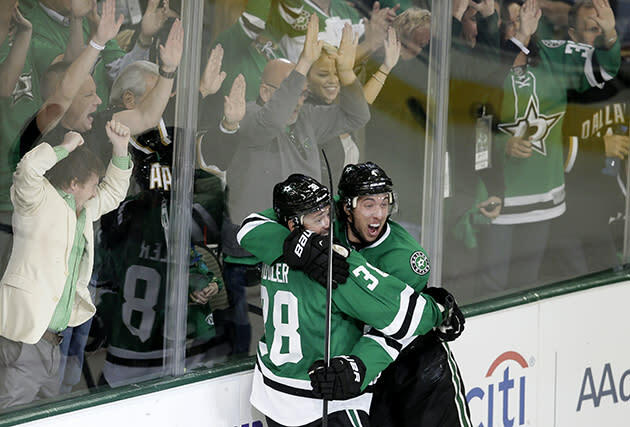 Vernon Fiddler, Brenden Dillon and the Dallas crowd react to Joe Thornton scoring his fourth goal of the game. "There it is, man! There it is!"